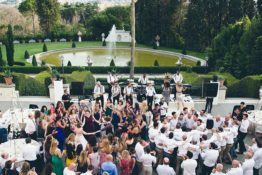 Are you looking for a classy winter wedding in a city of art in Italy? 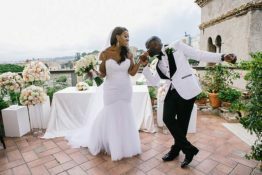 How about Rome and its never ending charm for your winter destination wedding in Italy? Julian and Mariam decided to celebrate their marriage on the December the 30th 2016, one day before New Years Eve. They invited all their friends and family coming from all over the world to have a two days events in the eternal city. 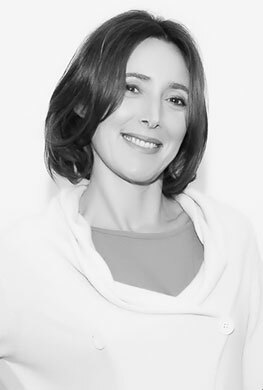 Mariam is a talented interior architect from Dubai and Julian is a funny and professional layer. They live in Luxemburg but Julian’s family lives in Rome, the city where Julian grew up. This is the reason why they chose Rome for their destination wedding. Before the Roman Catholic ceremony they decided to have some pre wedding pictures with bridesmaids and groomsmen inside elegant Lord Byron hotel. This is one of the most elegant Hotel in Rome in uptown Parioli area. They had some good Prosecco, laughs and lots of fun. For their wedding ceremony they chose Roman Catholic Church of the Most Holy Name of Mary at the Trajan Forum, a tiny round church located right in front of Trajan Column in the very heart of Rome. Church is richly decorated with important gold stuccos and paintings, a masterpiece of Italian art that dates back to 1743. As wedding reception venue, they chose amazing Galleria del Cardinale. It is located inside Palazzo Colonna, one of the oldest and largest private palaces of Rome, whose construction began in the fourteenth century by the Colonna family, who still resides there since eight centuries. Colonna family dates back to the twelfth century and comes from the town of Colonna, near Rome, from which it takes its name. Mariam had a precise idea of the design for her wedding reception, being an interior architect, she designed each detail on her own, from wedding stationary, to wedding favors giving also a very precise idea for wedding flowers and wedding decor. 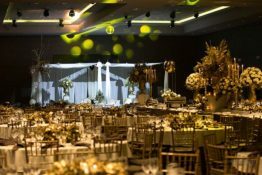 Wedding flower decorations were total white color while all details were black and gold, elegant but up to date. They perfectly matched Galleria del Cardinale with its gold stuccos. 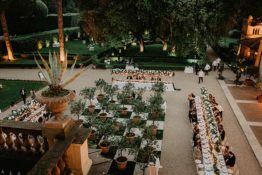 Once guests and the wedding couple arrived at Galleria del Cardinale, they entered the first central area where they found a round illuminated cocktail bar and buffets of appetisers. Guests also found a glittering wishing tree where they had to write and hang their wishes for the newlyweds, such a nice idea that also created a luminous and warm corner . After appetisers everybody was invited to the seated dinner area where the rich and elegant floral decorations with lots of candles, created a stunning effect. The long top table at the center of the hall for the nearest friends and family and round tables around it made a warm hold around the couple. The clou moment of the wedding reception was the cut of the wedding cake, a traditional Italian Millefoglie one thousand layers, one of the most delicate and elegant pastries: light, flaky puff pastry layered with rich vanilla cream, whipped cream, or chocolate cream, or a combination thereof. Simply delicious! After the cut of the cake, dances started. A great dj with an involving playlist and a fully equipped cocktail bar made everybody happy and all guests danced till late at night. It’s been a great event in a warm and joyful atmosphere and it’s been a great pleasure for us to be part of this amazing wedding, we’ve been honoured to work with Mariam and Julian, friends we’ll keep in our heart. We wish to thank David Bastianoni for the amazing pictures.